The arsenic mitigation method developed by the Department of Public Health Engineering (DPHE) and Danida is based on the oxidation of all aqueous arsenic to As(V), or arsenate, and subsequent co-precipitation with aluminum sulfate (alum). The above are all locally available, and the total cost is approximately Tk300 to Tk350 (US$6.00 to $7.00) per system. A wooden stirring rod and a measuring scoop designed especially for the 20L buckets are made at a school in Dhaka, but any rod or measuring scoop can be used. The chemical powder will be prepared and packed by local businesses based on manuals now being prepared. The chemicals are both familiar to potential users of the system, and their cost per 20L of water is about Tk0.12 plus packing cost of about Tk0.05. A family that treats two buckets of water a day-enough for about 5 people-will face a monthly running cost of about Tk10, or slightly less than 1% of their income (research suggests that poor families in Bangladesh are willing to spend at most 3% of their income for water and sanitation). The buckets are coloured in analogy to the nation-wide practice of painting arsenic-affected tubewells red and safe ones green. The red bucket is placed on top of the green one, and they are connected via a plastic tap about 10cm from the bottom of the top bucket, which empties into plastic tubing that channels the water into a filtering device inside the bottom bucket. The filter is a ten-inch length of PVC pipe filled with sand. The water enters the pipe at the top, passes through ten inches of sand, and exits through a screen at the bottom. Water is drawn from the bottom (green) bucket via another plastic tap about two centimetres from the bottom of the bucket. >Untreated tubewell water is poured into the top bucket, the alum and potash powder is added, and the solution is stirred vigorously for 10-15 seconds. After roughly an hour of coagulation, flocculation, and sedimentation, the tap can be opened for the water to flow into the green bucket. The sand filter provides additional protection to keep the flocculate out of the drinking water, which is drawn directly from the green bucket. Weekly cleaning of the sludge from the top bucket seems to be sufficient. One problem with the production of the chemical powder is that it must be very fine in order to dissolve in an acceptable amount of time and to work with adequate efficiency. However, the production of such fine powder is not impossible for local organisations and entrepreneurs and should not pose a long-term obstacle to making the system affordable and accessible to people throughout the arsenic-affected areas of Bangladesh. Karin Steinberger on 30.06. 99 reports in Sued Deutsche Zeitung that method developed by the Danish International Development Agency (DANIDA) initiated with problems such as villagers refuses to use the water for cooking as the taste of food badly deteriorate. This is due to the addition of potassium permanganate that not only is bad in taste but also serious environmental and health concern. Since the introduction of plastic industry in Bangladesh thousands years old pottery is at the stage of extinction. This environmentally sustainable pottery products not only a great cultural heritage of Bangladesh, they gave hundred thousands of families job in the rural areas of Bangladesh. In early days villages sent their products to the cities and now the reverse has occurred. Villagers displaced from their job are taking shelter in the slums of Dhaka City. Plastic and aluminium are both harmful to health. Vinyl chloride (a known human carcinogen), lead, cadmium and other metals are added to plastic to increase its resistance. Distribution of water through plastic pipes has been banned in California, USA as result of concern about the quality of drinking water. In Bangladesh environmentally sustainable cheap clay pots and others are replaced by plastic and aluminium. At present Bangladesh is facing environmental problems due to the rapid increase use of plastic material. Once the Government announced banned on plastic/polythene use in the country. But because of the high lobby of the industry substantial measures to stop production did not take place. Millions of potters in Bangladesh are counting their days for extinction although this group served this nation with sustainable and cultural products for all age groups since thousands of years. It is not understandable why environmentally conscious Danish International Development Agency (DANIDA) introduces unsustainable products that diminishes poverty alleviation programme that they have targeted. Aluminium concentration in natural water in Bangladesh is quite high. Peuraniemi, Institue of Geoscience and Astronomy, University of Oulu, Finland found aluminium concentration in investigated areas of Bangladesh notably higher than typical values world-wide. Aluminium concentrations in all surface waters greatly exceed that of WHO (1996) drinking water standards (200 µg/l) in all areas studied (Islam, et al., 2000). There are an increasing number of studies pointing to a pathogenic role of aluminium in the onset of Alzheimer's disease. Aluminium accumulates in the nucleus of tangle-bearing neurones in-patients with Alzheimer's disease (Perl and Good, 1988). The primary source of aluminium in drinking water is alum and therefore it is recommended in the industrial countries to reduce use of alum and conventional filtration is also effective. In industrial countries average 2 L water are consumed daily that is 20-45 mg aluminium intake occurs in a 70-kg reference man. The drinking water guideline of 0.05 mg/l for aluminium is used. Besides adding alum will increase sulphate concentration in drinking water that weak immunised rural population specially children will be additionally subject to diarrhoea diseases. Although sulphate concentration in Bangladesh is generally low but in a few wells show a relatively high sulphate concentration (Brömssen, 1999). One may argue that supporters of aluminium do not want to believe aluminium as a hazardous mineral. Once the inventor of DDT was crowned with the Noble Prize but it took generations to understand its harmful effects. · It is poisonous if it is added to drinking with water. etc. · R50/53 describes that it is very poisonous to the micro-organisms in water and in long term can cause serious harm to water resources. After the introduction of pesticides numerous deaths and injuries occur due to unsafe handling in rural Bangladesh. Besides taste many negative health effects will be added to the rural population of Bangladesh. DDPH and Danida could not show any safe disposal of arsenic sludge in the rural area of Bangladesh that may recycle to the ground water. Besides only one grade of coarse sand will be difficult to maintain and within a short time filtration will slow down and rural people will switch to unfiltered, as it has been observed. It is very criminal to see that even the highly educated laboratories of Bangladesh dispose of their effluent directly to the public sewerage. At present several thousands of water samples are analysed in different laboratories of Bangladesh. A prescribed safe disposal is urgently needed. If it is not possible to introduce safe disposal procedures in highly educated, foreign trained institutions of Bangladesh - how can we make an arsenic mitigation programme for rural Bangladesh? 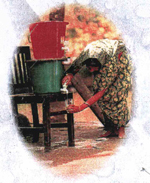 Two bucket filter to remove arsenic was introduced by Danish Aid and NGO Forum, DPHE. Danida introduced a year ago two bucket system replacing one poison to other. A huge amount of money has been spent to make this project a success. People have rejected this project. If you visit villages, you'll find villagers are using the buckets for using other purposes. If you ask villagers, they say, "First the water does not taste, colour of water becomes red and it is difficult to use the method!" It was never published how much tax payers money was spent! We could not find any single unit is in use. But NGO Forum office said that two bucket system is used in the villages! We did not spent any more time to visit here again.